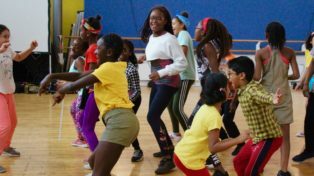 Challenge 59 is a dance and film project for KS1 and KS2 teachers and pupils from east London that puts children and young people in charge of actively engaging with physical and emotional health issues within their communities. The project launches with a teacher’s Continuing Professional Development (CPD) session on 1 November 2017 at Rich Mix. Schools taking part can thereafter access a Dance & Film Education Resource which equips teachers and their pupils with a 6-week dance scheme packed with fun and easy-to-learn online dances, creative games and tasks around physical and mental wellbeing, as well as a film & storyboard toolkit, aiming to inspire schools to create their very own ‘healthy message’ dance-films. Participating schools will be challenged to submit a storyboard idea relating to a local health issue. A multi-sector expert panel will crown three schools the winners of a 6-week artist residency with a dance & film team to make their storyboards into broadcast-quality films. Winning films will be screened at Rich Mix in summer 2018 and distributed via national TV broadcast networks. Schools might decide to use this project further to gain Artsmark Status and Healthy Schools London awards. Teachers attending will be given access to a free substantial dance & film education online resource worth £55. Funded by Arts Council England Grants for the Arts, Dance Enterprise Ideas Fund and THAMES. Supported by Rich Mix. In partnership with University of Bath. Challenge 59 launches with a teacher CPD to be held on 1 November 2017, 1-5pm at Rich Mix. Teachers attending will be given free access to a substantial dance & film education online resource for KS1 & KS2 worth £55. East London Dance launch brand new youth dance company for 14 – 18 year olds! The Youth Advisory Board is a group of eight young people from across East London who will help design and develop participation and youth engagement projects for East London Dance.